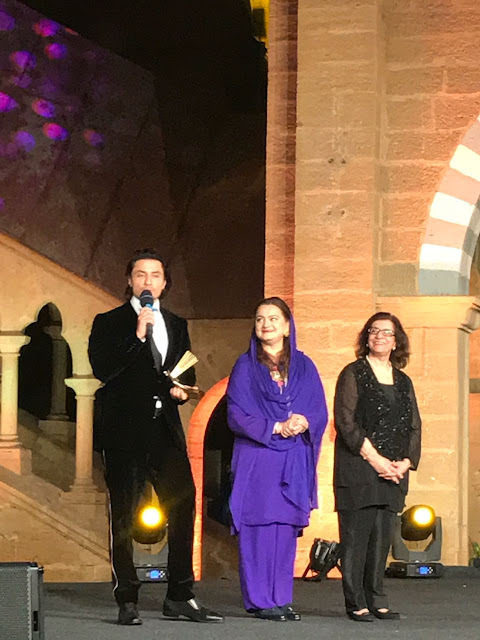 Pakistan International Film Festival hosted a start-studded evening for its first awards gala ceremony on the closing day of the four-day festival at Frere Hall, Karachi. The event also featured live performance of Sufi Music Maestro Abida Parveen and a fashion showcase, followed by dinner. The award ceremony kicked off with Sarwat Gillani and Azfar Rehman as the first hosts. 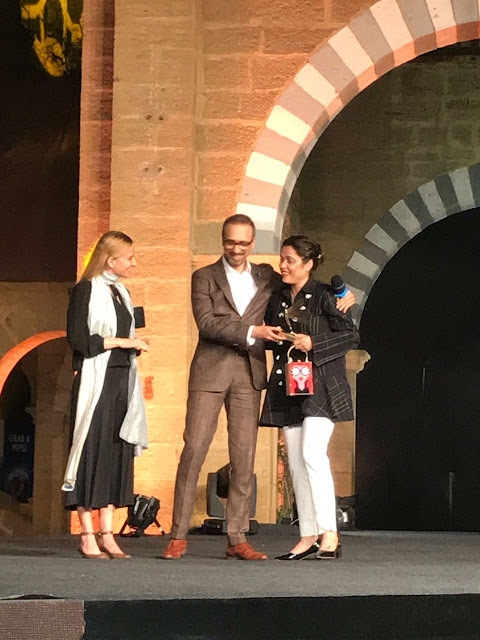 In the category of best documentary feature “Parween Rehman-The Rebel Optimist” directed by Mahera Omer from Pakistan won the award which was presented by Ali Rehman Khan and Kubra Khan. In the category of best documentary (short) Veil Done from India won the award. 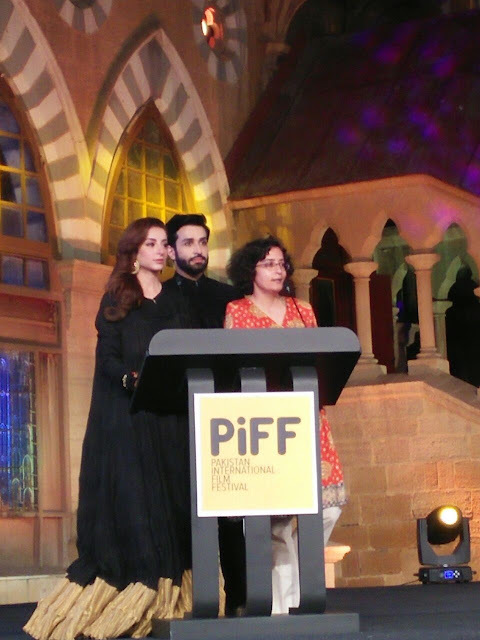 For the category of best short film Aghai Nazem from Iran won the award which was presented by Fiza Ali Meerza and Nabeel Qureshi. In the category of best feature Lala Begum, directed by Mehreen Jabbar won the award which was presented by Mahira Khan. Following these categories Ayesha Omar and Ahsan Khan joined the evening as the hosts. In the category of best editor Mitesh Soni (Jannan) won the award which was presented by Shobu Yarlagadda (producer of mega blockbuster movie Baahubali) and Nadia Hussain. In the category of best cinematography Rana Kamran won the award for Na Maloom Afrad 2 which was presented by Asim Raza and Martha Mitchell. Following these categories the lead cast of Cake Aamina Sheikh, Sanam Saeed and Adnan Malik joined as the hosts. In the category of best debut female Hania Amir won the award for Janaan and in the category of best debut male Ali Rehman Khan won the award for Janaan. Both these awards were presented by Imran Abbas and Sabrina Chiolfi (Italian academic researcher on South Asian films). In the category of best writer Khalil ur Rehman won the award for Punjab Nahi Jaungi which was presented by Nadia Khan and Subhash Kapoor (director of Jolly LLB 1 and 2). In the category of best director Nadeem Baig won the award for Punjab Nahi Jaungi which was presented by Momina Duraid and Anjum Rajabali (Indian actor, script/screenplay writer). The recognition awards were given to Dawn Media Group, HUM TV and Jamil Baig of Nueplex for their contributions and efforts in making Pakistan International Film Festival a success. Ali Zafar was honoured with a special award in the category of artist for peace at the event. These awards were given by Sultana Siddqui and Marriyum Aurangzeb. Following these categories the stage was shared by Sarwat Gillani and Ayesha Omar as the hosts. In the category of best film Punjab Nahi Jaungi won the award which was presented by S. S. Rajamouli and Meera. In the category of best music Sahir Ali Bagga won the award for Arth-The Destination which was presented by Ali Zafar and Hadiqa Kiyani. In the category of best actor female Mehwish Hayat won the award for Actor in Law which was presented by Sania Saeed and Humayun Saeed. In the category of best actor male Fahad Mustafa won the award for actor in law which was presented by celebrated Indian actor Vinay Pathak and Hareem Farooq. The four-day festival comprised panel discussions on the subjects of ‘Film Diplomacy & Cross Border Collaboration’, ‘Innovation on Screen: Digital Dimensions’, ‘Genre Busters’, ‘From Script to Screen and Beyond’, ‘Films for Change: Socially Motivated content in South Asian Film Industry’ and ‘The Future of Music and Lyrics: How important is music in the sub continental cinema’. The participant lineup was diverse and included prominent local and foreign speakers; Asim Raza, Anjum Rajabali (celebrated Indian script/screenplay writer), Nandita Das (actor/director/producer of upcoming Indian movie Manto), Harsh Narayan (Indian filmmaker), Sajal Aly, Rashid Khwaja, Abrar Ali Khan, Farees Shah, Faizan Syed, Adnan Sarwar, Sana Tauseef, Atiqa Odho, S. Rajamouli (director of the mega blockbuster movie, Baahubali), Vinay Pathak (acclaimed Indian actor), Kamran Jawed, Amin Farooqui, Tahir Moosa, Zeenat Lakhani (writer of Saba Qamar starrer Hindi Medium), Saket Chawdhari (director of Hindi Medium), Nishtha Jain (maker of documentary film Gulabi Gang), Haseena Moin, Jami, Subhash Kapoor (prominent Indian producer, screenplay writer and director, known for his work in Jolly LLB 1 and 2), Vishal Bhardwaj (Indian filmmaker), Hareem Farooq, Izzat Majid, Asif Noorani, Sultan Arshad, Rekha Bhardwaj (Indian playback singer), Dr Omer Adil, Nila Madhab Panda (director of Kadvi Hawa) and Mr Shobu (producer of mega blockbuster movie Baahubali). There were a total of eight movie premieres - Cake, The Valley, Lala Begum, Moomal Rano, Zaraab, The Song of Scorpions, Kuch Bheege Alfaaz and The Wishing Tree. Apart from the premieres, screenings of short films, documentaries and feature films were organised at various institutes throughout the city including Goethe Institut, Iqra Defence Valley, Iqra University North Nazimabad campus, Alliance Françoise and T2F. 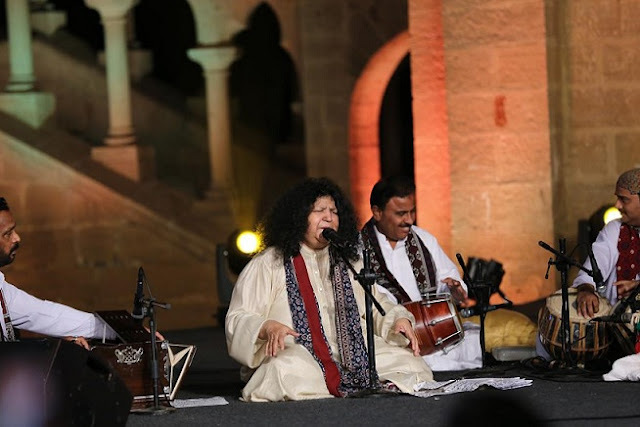 The festival was supported by the Cultural Department of Sindh Government and Ministry of Information of the Federal Government of Pakistan, HUM TV, Nueplex Cinemas and Dawn Media Group. Commercial partners for the event were Unilever and Khaadi.